In April 2006 I had the great pleasure of traveling with a group from the Arizona State Museum, in Tucson, to the Rio Mayo villages in Sonora to observe Easter celebrations by the Mayo Indians there. We were led by Diane Dittemore, a curator at the Arizona State Museum, with the assistance of Emiliano Gallega Murrieta, an ASM Intern who had grown up in Sonora. We visited Leonardo Valdez, who had established a Museo in Etchohoa to display his collection of Mayo Fiesta regalia. 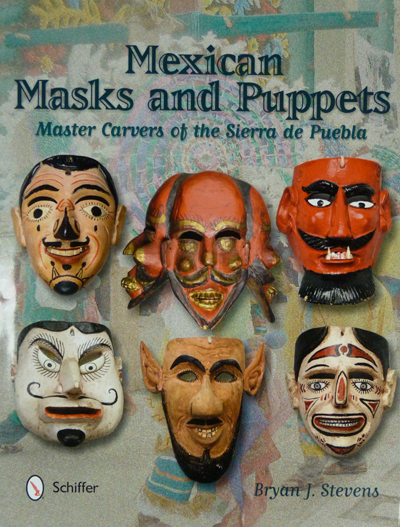 By coincidence, we ran into Bill and Heidi LeVasseur there; they later established a mask museum in San Miguel D’Allende, and Bill’s book followed to catalogue their museum collection—Another Face of Mexico (Art Guild Press, Santa Fe New Mexico, 2014). The group encountered a number of Mayo Pascola dancers, and we saw some attractive masks being danced, but it seemed that those were not available for sale at that time, and perhaps they were already promised to Leonardo Valdez. Then again, it is also my impression that danced masks are frequently not sold in the exciting time surrounding a fiesta, particularly if the dancer is using his favorite mask. Later, when the dancer wishes to raise cash, he may sell a mask that is no longer wanted. We also visited with several mascareros (mask carvers) and they did sometimes have new and undanced masks to sell. This leads me to the subject of “made-for-sale masks.” Popular carvers are often asked by Pascola dancers to make masks to order, with particular desired features and sized to suit that dancer. However, in the absence of such orders the carver may elect to produce masks that he hopes to sell to some future customer. These made-for-sale masks may reflect local traditional design preferences or not. Ultimately they will prove to be either suitable or unsuitable for use by the average Pascola dancer, depending on the mask’s details and the dancer’s preferences. The suitable masks are meant to interest dancers as well as tourists or collectors, while the unsuitable ones are obviously produced for the latter groups and not for traditional use. Thus the term made-for sale is not inherently indicative of whether a mask is faithful to local traditions or not. In today’s post we will look at a pair of made-for-sale masks. I bought this first mask from Arnulfo Yocupicio when we visited him at his workshop, in Masiaca, Sonora. I don’t know whether Arnulfo is related to Manuel Yocupicio. He carves traditional human faced Pascola masks that are painted black, along with others of dogs or wolves. Here is one of those wolf masks. 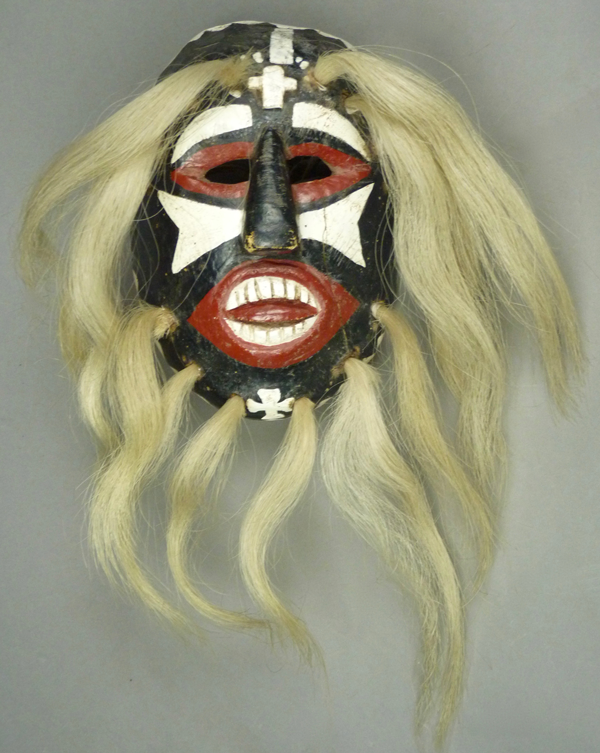 Although such canine masks are popular among Yaqui Pascola dancers, one only occasionally sees danced Mayo examples. This mask has very long (and carefully applied) hair, a trait that Rio Mayo carvers had recently copied from the Rio Fuerte Mayo style in Sinaloa. I bought this mask from Tom Kolaz in 1998. The carver was unknown, and the mask, which was found in La Union, Sonora (near Huatabampo), was thought to date to the 1930s. 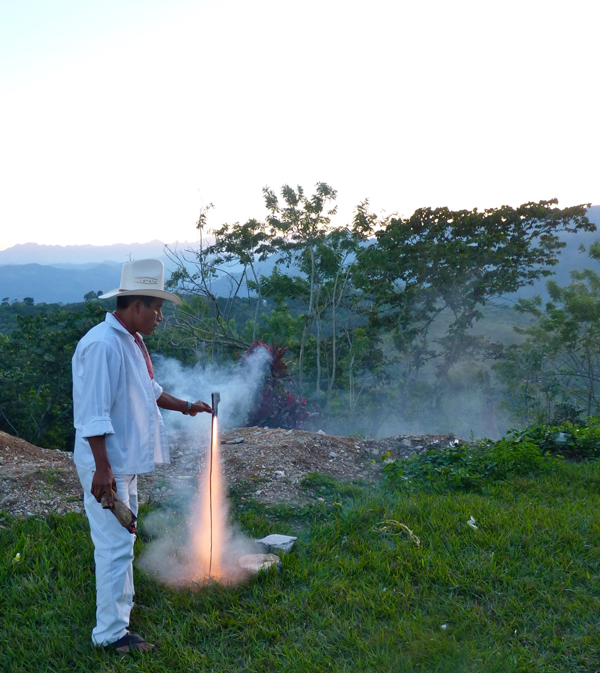 Many years ago, in the course of a fiesta, firecrackers (typically cohetes, or small rockets) were set off. One of these somehow flew off in the wrong direction, entered a sack containing this mask, and exploded. During a fiesta, individual skyrockets can be set off to communicate with God, or many rockets can be attached to a wooden framework that is carried through the fiesta on someone’s back. These fireworks tend to fly off in many different directions, as I observed during a Rio Mayo fiesta in 2006. Probably it was such a rocket that damaged the mask. Here is a photo that I took in the Sierra de Puebla of a celebrant setting off an individual cohete. He lit the wick with the smoldering wood that he is holding in his right hand, and his left hand will release the rocket when he fells it pulling against his grip. This one went straight up, as planned. If he had released it too soon it might have fallen to the ground and slithered off just above ground level. At any rate, such a rocket ended up in proximity to this mask, and the chin of the mask was damaged. Later, paper package tape was plastered over the the rough edges, and the mask remained in service for many years longer, so that the paper tape acquired its own patina. Here is this damaged old mask. This mask has an oversized nose, and an extended tongue that is carved in high relief. The openings for vision are just a little different than most of the ones we have seen in this series, being horizontal on the lower edge and curved on the upper edge. There is a broad snouted area over the mouth. Today’s mask is one that I received in a trade, back in 1996. It had been originally collected in Sonora from the niece of the carver, Juana Sotomea, probably in the mid-1980s. Juana identified the carver as Juan Sotomea, of Paredón, Sonora. This mask has the convex cheeks that we find on masks by the Alameas, but it has a nose design that rules both of them out as the potential carver. This is a traditional and well carved mask that is typical of the overall Rio Mayo style. Although the lower teeth are broken, this mask has wonderful patina and I find it highly attractive for that reason. It was said to have been carved circa 1960. The face of this mask is entirely covered with pink and white paint; both colors are worn and faded. The hair bundles for the beard are entirely gone, while most of those for the brow remain. The teeth of the upper jaw were indicated by inscribed vertical lines, and probably the lower teeth were as well, but that lower area was long ago broken, and the broken edge is darkly stained following further use. I bought today’s mask from Tom Kolaz in March, 2017 . He found it interesting because the Mayo family in Pozo Dulce Sonora who sold it indicated that it had been used by three generations of Pascola dancers. The seller, who was the grandson of the original owner, was 70 years old! The mask had obvious age to support this history, and I suspect that it could easily date to circa 1940 or even earlier. The grandson reported that his grandfather was the carver, but that individual’s name was not recorded. Nor did Tom find the style indicative of a known carver. Therefor I bought it as a terrific, old, but anonymous mask and hung it in a place of honor on the wall, with the expectation that the name of the carver was probably forever lost. As you will see, one aspect of this mask that serves to obfuscate it’s identity is the style of the hair, which is extremely long and silky, of horsetail, copying contemporary Sinaloa Mayo style. When I looked again at this mask recently, I kept thinking that it had familiar features. Having just studied a number of Rio Mayo Pascola masks for this blog, I am seeing this mask with fresh eyes. At the end of the post I will tell you whose hand I am reminded of, but meanwhile you can play this game for yourself. 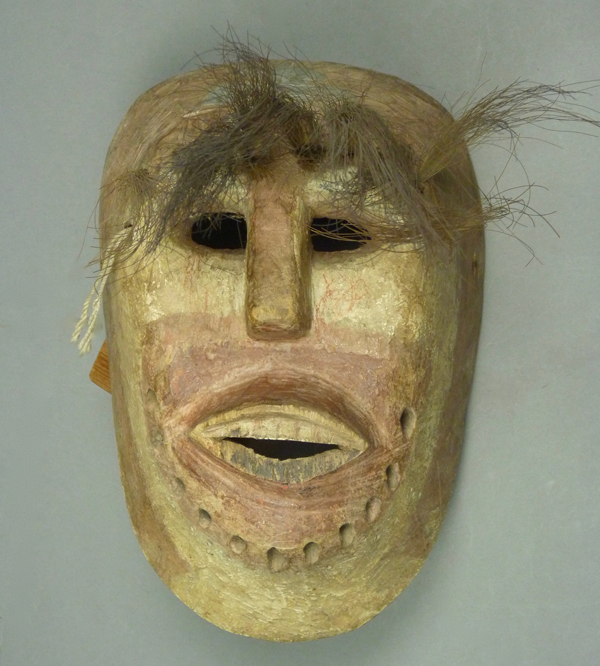 Here is this week’s mystery mask, and to the right are links to my recent posts about identified Rio Mayo carvers (September, October, and November 2018). At first glance, the most obvious feature of this mask is the extreme length of the hair, a characteristic found in contemporary Pascola masks made in the Rio Fuerte Mayo villages of Sinaloa. Given its age, this mask has probably been re-haired more than once, and this Sinaloa style hair has been showing up on Yaqui and Rio Mayo masks in recent years. Masks often arrive in the hands of a collector without the name of the carver. Through comparison with other masks in Museums and private collections, it is often possible to attribute an anonymous mask to a particular known carver’s style. Sometimes this attribution is easy, because the mask is so characteristic of a particular hand. However, there are inevitably other masks that defy such identification. 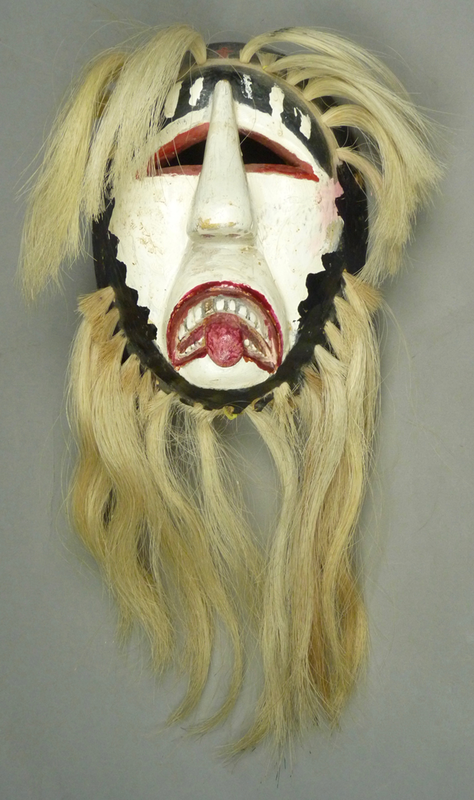 I will be featuring such unidentified masks in a series of posts, beginning with this one. I purchased this mask from Robin and Barbara Cleaver in October, 1988. It had recently been discovered by Roberto Ruiz in Navojoa, Sonora, a Mayo market town near other Rio Mayo villages. The most distinctive feature of this mask is the forehead cross, in this case a Christian Cross that has been carved in relief. You may recall that we have examined a few masks with painted Christian crosses and several more with inscribed (or gouged) Christian crosses, but this is the only example known to me of a Rio Mayo mask with a Christian cross that was carved in relief, and the majority of Rio Mayo masks have gouged Maltese crosses. The black paint of the face appears to be old and worn, while the areas painted white and red may have been redesigned and/or repainted. In other words, this mask may have had a different appearance when it was new. It is certainly handsome now. There are what are called “triangular” eyes. The nose also has a triangular profile, from the side and from the front.